ENLIVEN YOUR SENSES WITH THE BROADEST HEMP EXTRACT WITH CBG EVER FORMULATED. By the drop, RECEPT absorbs rapidly into the bloodstream reactively promoting fast-acting, long-lasting therapeutic benefits. A lifestyle of wellness begins with pure, premium ingredients. 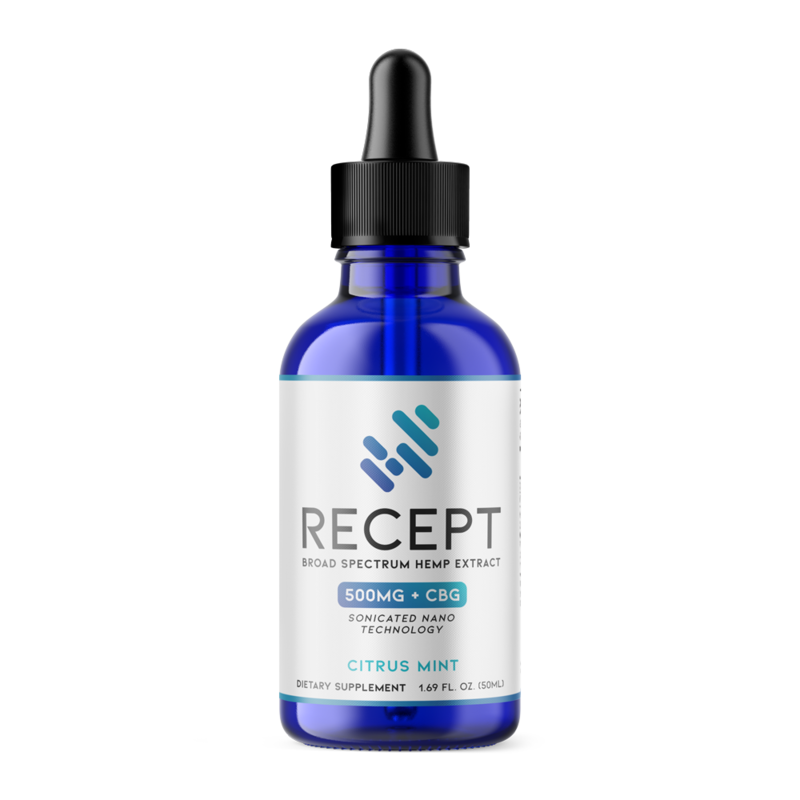 The high-quality hemp extract in RECEPT’s broad spectrum blend is sourced from 100% organically-grown hemp that’s been nurtured and ethically farmed right here in America. We took calculated measures to decipher how a hemp and phytocannabinoid product could be improved and made better. For us that started with expanding the phytocannabinoid and terpene profile as a way to develop a more well-rounded entourage effect. HOW CANNABIGEROL (CBG) CHANGES EVERYTHING ABOUT THIS FORMULA. A precursor or parent compound to many other phytocannabinoids like CBD and THC, CBG’s potential effects on health and wellness have only begun to be tapped. CBG is naturally occurring in the hemp plant in very trace amounts and has been found to be more prevalent in younger hemp strains. We take careful and complex steps to extract CBG for its use as a central ingredient during the formulation process of RECEPT. The entourage effect is the concept that various compounds in the hemp plant work best when synergistically together, rather than being isolated. When this orchestration of compounds interact harmoniously, this promotes a more impactful health result. The endocannabinoid system (ECS) is a vast signaling network of receptors that resides in all mammals. Present in and connected to the body’s organs, glands, and tissues, the ECS regulates many physiological and cognitive body processes. Poor lifestyle and diet, exposure to toxins, and internal and external stressors can drastically imbalance the body. By activating your body’s receptors, your ECS helps create ideal homeostasis within the mind and body. 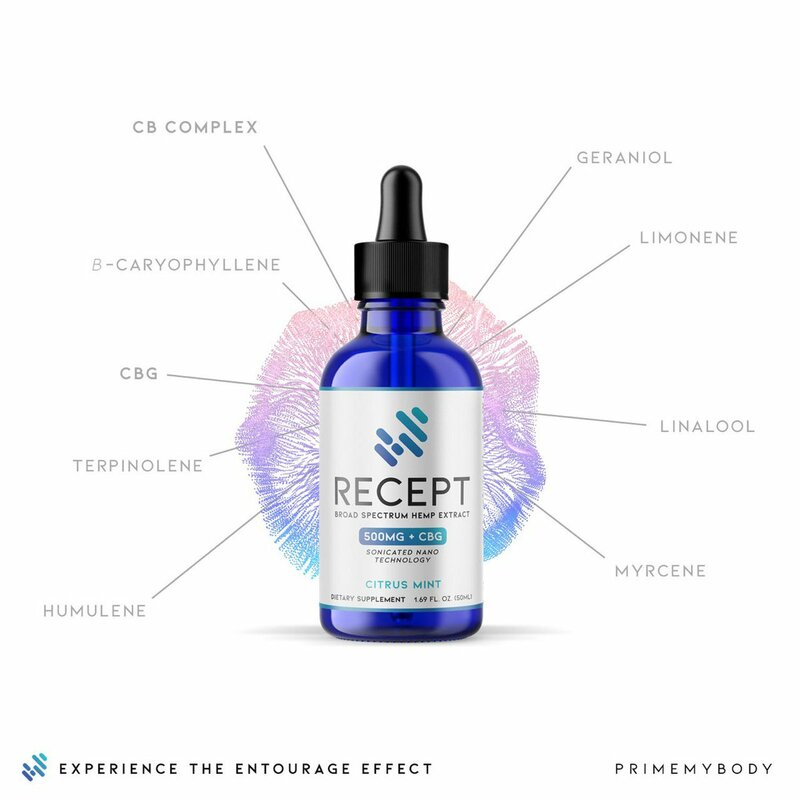 Like a biological key, the nutrients from RECEPT’s phytocannabinoids and terpenes interact organically with the ECS, boosting its effectiveness and helping to revitalize and maintain optimal well-being. 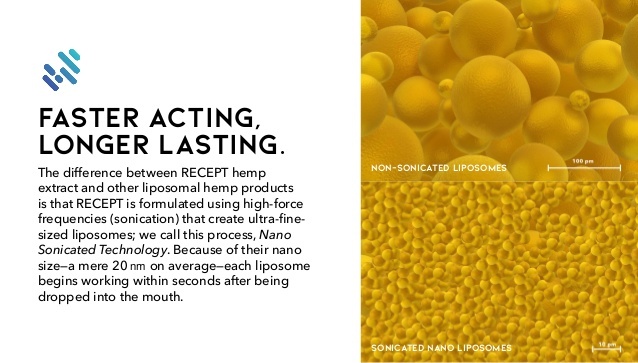 The health benefits of RECEPT’s phytocannabinoids and terpenes are driven by a powerful nano-sonicated liposomal delivery method. Using ultrasonic wave technology, RECEPT’s active ingredients are compressed into ultra-fine-sized liposomes that easily absorb into the bloodstream, transport across cell membranes and begin interacting with cells, cannabinoid receptors, and the ECS within moments after dosing. RECEPT’s sonicated nanoparticles average between 15 to 25 nM (nanometers) in size—roughly the length of an antibody protein. This tiny nanoparticle range accelerates RECEPT’s activation time and prolongs its therapeutic effects on the brain and body. A safer and more natural approach to liposomal delivery, RECEPT’s ingredients are ethanol free. Sonicated NanoTechnology is the next evolution in hemp extract delivery. LOOKING FOR MORE RECEPT INFORMATION? Contact Jeanne by email to answer all your questions! The link to purchase below will take you to a new page to order. I am an affiliate with PrimeMyBody and personally have had so much success with their hemp oil, that I want to share this with everyone who needs it!